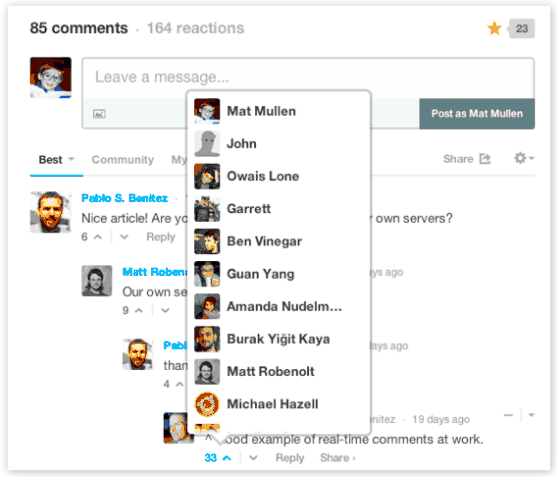 Commenting platform Disqus released new features today giving more control to their users. In this update, the service enables anyone to find out who upvotes their comments, provides the ability to hide their comment activity from public view, and find their friends using Facebook Connect. 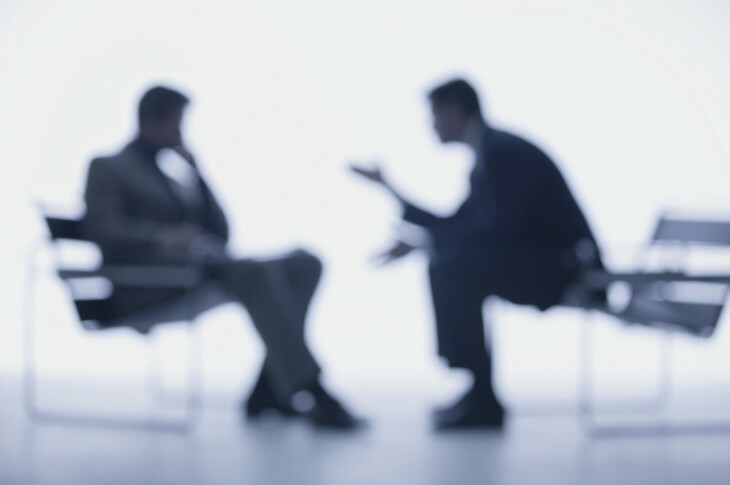 With these features, the company says that it will make it easier to “find and follow interesting Disqus users on your favorite communities.” Believe for a second that users would be interested in this idea, with 120 million people sharing on the platform every month, there’s clearly no shortage of new information and content to be found. So it can be believed that just as Facebook has privacy controls, so should Disqus — some people just want to have the expectation that they can control who sees what they post. After all, even comments should be protected in some ways, right? One of the key features of Disqus is the ability for users to upvote comments, pushing the more interesting and relevant responses to the top of the comment thread. People don’t want to scroll down to the bottom of the page just to find the one piece of info that’s useful — it should be at the top. Until today, upvotes were mostly anonymous — people seemed to be content with just knowing the number of upvotes their comment received. Users can simply hover their mouse over the upvote count and it will display the Disqus users who have found the information to be helpful. By doing so, users can find people that might have share common interests and then choose to follow them or subscribe to their feed to be entertained by their thoughts. Starting today, Disqus is also making it possible for people to keep their comment activity private, meaning only you can see it. However, don’t mistake this as a fix to hide any comments you make on a blog or website — only the comments that appear on your Disqus profile will be marked private. If you leave a comment on this post, it will be seen, no matter your status. 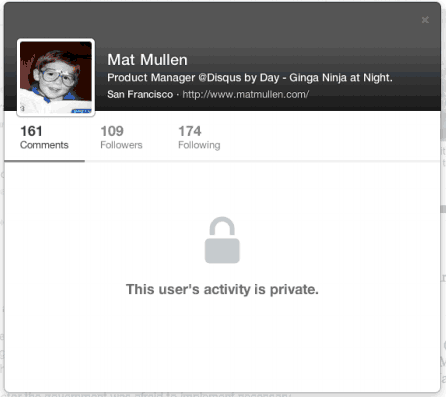 Disqus says that when marked private, account history and activity will only be visibile to the comment creator. Additionally, nothing will be visible on your profile or through daily digest emails. Furthermore, no one will be able to follow your account — existing followers will remain, but will be blocked from seeing anything. Lastly, Disqus has added support for Facebook so that users can now find their friends from the social network right on the commenting platform. The service already makes it possible for users to share comments on Facebook, but until now, it appears finding people was rather constrained. Today’s content discovery offerings largely exist as little blue links surfaced by fairly blunt targeting capabilities. It’s recommended content and has little of the serendipity that comes with a true discovery experience. Think of an archaeologist digging for artifacts. Content discovery will become much more personalized and responsive to user input. It will be another unique experience delivered by the publisher. Today’s news comes two months after the company announced it had 100 million profiles. It competes against the likes of Livefyre.